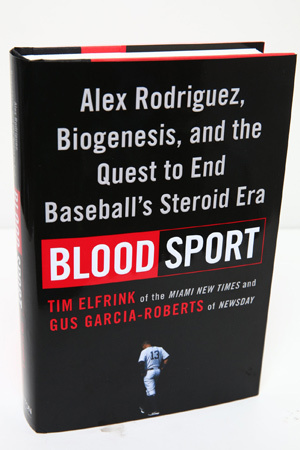 The following is an excerpt from Blood Sport: Alex Rodriguez, Biogenesis and the Quest to End Baseball's Steroid Era, by Tim Elfrink and Gus Garcia-Roberts. Published by arrangement with Dutton, a member of Penguin Group (USA) LLC. Copyright 2014 by Tim Elfrink and Gus Garcia-Roberts. This story appears in the July 7-14, 2014 issue of Sports Illustrated. To read a digital version of the magazine, go here. As had been the case in the years after he joined the Rangers in 2001, Alex Rodriguez’s first four seasons in the Bronx were marked by incredible individual statistics and disappointing team results. The Yankees failed to make the World Series from 2004 to ’07 -- but Rodriguez did win the second and third MVP awards of his career, in ’05 and ’07. The latter year was particularly impressive: He hit 54 home runs, including the 500th of his career, becoming, at 32, the youngest player to reach that milestone. He also drove in 156 runs and scored 143 -- both career highs—and led the majors with a 1.067 OPS. It all added up to an easy choice when voters filled out their American League MVP ballots. Rodriguez received 26 of 28 first-place votes. What hasn’t been reported until now is that Rodriguez won that MVP with permission from Major League Baseball to use performance-enhancing drugs (PEDs). From his junior year of high school there had been suspicions -- and, in the case of his 2003 MVP season, proof by way of a failed steroid test that came to light six years later -- that Rodriguez used PEDs. In August 2013, Major League Baseball suspended Rodriguez for 211 games for multiple violations of its PED policy, a decision he appealed last fall. A transcript of a confidential arbitration hearing obtained by the authors of this book suggests that Rodriguez put up those monster numbers in 2007 with the help of a powerful anabolic steroid. Under baseball’s performance-enhancing drug policy, players can apply for a so-called therapeutic use exemption (TUE) to take certain medical substances otherwise banned by MLB. A doctor appointed by both sides—the independent program administrator (IPA) -- reviews all applications. Baseball also has an expert medical panel to advise the IPA. If an exemption is granted, the player cannot be punished for using that substance. The exemption is good for one year. Before the 2007 season, Rodriguez asked for permission to use testosterone, which has been banned by baseball since 2003. The IPA in '07 was Bryan W. Smith, a High Point, N.C., physician. (Baseball did not yet have the advisory medical panel.) On Feb. 16, 2007, two days before Rodriguez reported to spring training, Smith granted the exemption, allowing Rodriguez to use testosterone all season. During the 2007 World Series, as the Red Sox were sweeping the Rockies for their second championship in four seasons, Rodriguez hijacked the headlines by opting out of his contract with the Yankees. Six weeks later, the team signed him to a 10-year deal that guaranteed him $275 million to stay in pinstripes until '17. In addition, the Yankees added $6 million-a-pop clauses for each all-time home run leader he passed, starting with Willie Mays at 660 and ending with Barry Bonds at 762. Even after securing his latest windfall, Rodriguez wasn’t done seeking exemptions that allowed him to boost his testosterone levels with banned substances. In January 2008, according to the arbitration hearing transcripts, he requested two exemptions. Rodriguez wanted to use clomiphene citrate (Clomid), a drug designed to increase fertility in women. It is also prescribed to men who suffer from hypogonadism -- a testosterone deficiency -- to block the production of estrogen in their bodies. The drug is popular with bodybuilders at the end of steroid cycles because it can also stimulate the body to make more testosterone. Rodriguez also requested permission to use human chorionic gonadotropin, a hormone known as HCG, popularly -- and misguidedly -- used for weight loss and also to produce testosterone. Both HCG and clomiphene citrate were banned with the 2008 season. Smith approved Rodriguez’s use of clomiphene citrate that year. The exemption for HCG was denied, but according to the transcript of Manfred’s arbitration testimony, that denial was “more of a recordkeeping thing than anything else.” Rodriguez’s physician communicated with Smith, and “in their back-and-forth the physician informed Dr. Smith that the player was no longer using [HCG],” Manfred testified. With permission to use clomiphene citrate, Rodriguez was once again one of the few players allowed to take medicine designed to increase testosterone levels. In 2008, three major leaguers were granted exemptions to take drugs to treat hypogonadism. In fact, from the 2006 season through 2013, only 15 were granted for androgen deficiencies and hypogonadism, the conditions that under MLB’s drug policy could require a medical testosterone boost. By 2008, Rodriguez had played at least a significant portion of his career -- including, at a minimum, two of this three MVP seasons -- with the apparent help of anabolic steroids and other performance-enhancing drugs. He was by far the richest man in MLB, which was finally coming to terms with its steroid problem. Rodriguez had a guaranteed contract until the age of 42. The only wise thing to do would be to ride out that contract while continuing to apply for dubious exemptions but staying on the right side of baseball law. But Rodriguez wasn’t the type for laurel-resting. The handshake that was both Tony Bosch’s biggest break and the beginning of his downfall came late on a sweltering night in Tampa. It was July 30, 2010, and Bosch was flanked by a friend, Jorge (Oggi) Velazquez. To the ballplayer they both called Cacique, or boss, they could have seemed a comical couple as they walked into his hotel room: Velazquez, a short, hard-eyed former liquor-store owner from South Florida with an intense temper, Bosch a twitchy, ingratiating character everybody called Dr. T.
This guy is the best at what he does, Velazquez promised Rodriguez, laying the salesmanship on thick. He can provide you with everything you need. The inquiry was rooted in both envy and concern. In 2008, Ramirez, who was traded from the Red Sox to the Dodgers during the season, had at age 36 seemed to rejuvenate his health and his swing, playing in all but nine regular-season games and almost doubling his home run output from the previous season, from 20 to 37. Of course, in 2009 Ramirez had been nabbed by baseball’s PED police -- he had been caught taking HCG and served a 50-game suspension. Bosch’s name had surfaced in the investigation: His father, Dr. Pedro Bosch, had written the HCG prescription for Ramirez, who did not have a therapeutic-use exemption from MLB. Bosch explained to Rodriguez that Ramirez had been busted because he hadn’t followed instructions. Getting caught, Bosch explained, was just Manny being Manny. It was “nearly impossible” for Bosch’s clients to test positive if they followed his protocol, he said. He would provide diagnostic blood testing, proper dosing and exact times at which the drugs should be administered. Rodriguez was sold. Bosch detailed the testosterone creams, growth hormone and other substances he would be recommending, and they made plans to meet again. Soon afterward, the nickname Cacique started appearing in Bosch’s notebooks. Other times, Bosch wrote AER next to his new client’s phone number. The initials stood, of course, for Alexander Emmanuel Rodriguez. The 2010 meeting between Bosch and Rodriguez was one part luck, one part cosmic inevitability and all parts Yuri Sucart, a cousin of Rodriguez’s who was the slugger’s frequent companion and unofficial personal assistant. In 2009 or early '10, Sucart, who was friends with Velazquez, had a weight-loss consultation with Bosch. Sucart, who had carried around extra pounds since childhood, was nearing obesity in his late 40s. Bosch put Sucart on a pounds-shedding regimen of supplements and hormones. Sucart doted on, and was employed by, his younger cousin. Sure, Rodriguez had burned Sucart by outing him as his steroid source to investigators and reporters when the slugger admitted in '09 to using PEDs from 2001-03 while with the Rangers. That cost Sucart access to MLB facilities, but it had also given him a salary bump. Sucart, who made under $60,000 from Rodriguez in 2006, saw his pay rise to $100,000 over the next five years. Rodriguez even had the Yankees make an extra 2009 championship ring, worth thousands of dollars, for his banned-from-MLB cousin. During his treatments with Bosch, Sucart wore Yankees hats and shirts and that championship ring. He also told Bosch that he worked for Rodriguez. Among the supplements Bosch gave Sucart were his signature “gummies,” fast-acting testosterone troches. Sucart told Bosch that he thought the troches packed an “unbelievable sense of energy recovery.” He added that he had given one to Rodriguez and that his cousin “loved it because of its explosive effect,” according to the arbitration decision. The long-distance flirtation between Bosch and Rodriguez lasted for months, until the superstar finally decided to take the plunge in late July 2010. After losing much of the '09 season to a hip injury, Rodriguez had stayed mostly healthy through the first four months of the '10 season. His numbers were unremarkable but steady: He had 14 home runs by the All-Star break, and against the Royals at Yankee Stadium on July 22, he swatted his 599th homer. Five days shy of his 35th birthday, he was about to become the youngest player to join the 600 club. When he next came to the plate, the umpire threw the pitcher a specially marked ball to deal to Rodriguez. Umps would continue to do this until he hit his next home run; the mark would be used to authenticate the milestone ball. But Rodriguez didn’t homer in that game. In fact, he didn’t clear the fence through the three games remaining in the home stand. The Yankees left for a seven-game road trip on July 26, and Rodriguez failed to connect during four games in Cleveland. For any other hitter, a two-week home run drought would barely register. But what began as a celebratory chase was turning torturous. As sellout crowds followed his every game, Rodriguez complained that stadiums of flashing cameras on each swing never let him forget the looming milestone. Even without the power drought, Rodriguez might have hooked up with Bosch eventually. Despite his enormous talent, Rodriguez spent his career seeking a synthetic edge, especially when struggling to meet mile-high expectations. Taken as a whole, Rodriguez’s greatest baseball achievements were inseparable from his use of PEDs. Now his body was corroding due to age. But all he needed was one more push to knock down those historic milestones and place himself among the all-time greats. The call came to Velazquez in late July, and he relayed the inquiry to Bosch: Rodriguez wanted to talk about becoming a client. They met at a Tampa hotel following a road loss to the Rays; Rodriguez, still stuck on 599, had gone 0-for-4. Sucart, who despite MLB’s ban had remained Rodriguez’s shadow, joined his cousin, Velazquez, and Bosch in the hotel room. The foursome met often. In early August, they gathered again, this time at Rodriguez’s $30,000-per-month apartment on Central Park West, a building that Denzel Washington and Sting also called home. Bosch insisted on drawing blood to design an appropriate protocol for Rodriguez. He then flew back to Miami with Rodriguez’s plasma, knowing the vial contained the opportunity of his career. Bosch consulted with a urologist, according to the arbitration decision. He also had lengthy conversations about Rodriguez’s medical history with Sucart. Bosch dreamed up an elaborate doping protocol that would take Rodriguez into December, built around testosterone, HGH, and growth-hormone-producing peptides. Less than a week later, Bosch traveled to see Rodriguez in New York; his luggage was packed with preloaded syringes. On Aug. 4, Rodriguez finally connected on a pitch and made a sold-out Yankee Stadium erupt. Home run No. 600 flew into Monument Park, the museum beyond centerfield honoring Yankees greats. As he rounded the bases, Rodriguez lifted his palms coyly. His teammates streamed out of the dugout to congratulate him, and he took a curtain call for the roaring crowd. At that point, fans knew only about Rodriguez’s positive steroid test back in 2003. That was still enough to mark Rodriguez forever as a cheater. But this moment was a step toward redemption and leadership in the eyes of the fans and his team. The previous October, he had finally earned a championship ring. Now No. 600 was out of the way. Rodriguez wasn’t on Bosch’s regimen yet. But even as he circled the bases, and after the game as his colleagues were praising him for succeeding without steroids -- “That’s a chapter of his life I think he’s turned the page on,” said hitting coach Kevin Long -- Rodriguez knew he’d found the man who would help energize the latter stage of his career. He was one week past his 35th birthday, and he was determined to collect every one of those milestone bonuses in his contract. He wanted to be the lone member of the 800 home run club, Bosch would later say. To do that would take a nature-defying power surge in his late 30s of the sort Barry Bonds had pioneered. But now, Tony Bosch had a believer. To purchase a copy of Blood Sport, go here.